Combined with brahmi and amla enhances and illuminates hair color tone, improves hair texture –naturally. Herbal conditioner is a unique formulation with natural do-good ingredients to provide complete care for you hair. Owing to our in-depth knowledge in this domain, we are specialized in providing Khadi Herbal Conditioner. Green Apple Conditioner Cleanser is an excellent hair tonic, it stops greying and dandruff and is a natural cleanser. Our company has been successful in winning appreciation from the clients as one of the most prominent names in supply of Khadi Hair Conditioner. It is an antioxident hair conditioner, It is easy to use, rinse-off conditioner that leaves your hairs soft and shinning and also protects it from damaging effects of sun. We are a top notch supplier of Khadi Hair Conditioner. Banking on our enriched industry experience, we are able to supply Khadi Hair Conditioner. 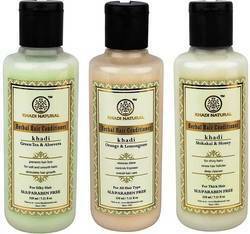 We are amongst the most reputed names in the industry, offering Khadi Hair Conditioner. We are the leading brand in exporting Khadi Hair Conditioner. These Hair Conditioner are specially manufactured by the team of highly skilled workforce under robust infrastructure. Our range of Hair Conditioner are available at market leading prices and is appreciated by the prestigious customers. Our reputed entity is engaged in supplying Khadi Herbal Hair Conditioner. we are amongst the most reputed names in the industry, offering khadi green tea aloe vera hair conditioner.